The October 16, 2012 debate was interesting for several reasons. First, there was a shift in the social dynamics between Barack Obama and Mitt Romney. As you can see in an earlier post, the first debate revealed Romney to be more authentic and slightly less optimistic and warm than Obama. Both were equally evasive in answering questions. Most striking has been the immediate reaction from pundits — who generally claim that Obama was far stronger, more assertive, and more engaged than he was in the first debate. Others note that Romney was more defensive. Our text analysis procedure showed that both candidates were surprisingly similar in their use of words across the two debates. We are pleased to officially announce that peoples’ personalities tend to remain constant over time and context. But first, the award winners. The authenticity award: Mitt Romney. Authenticity reflects markers of self-reflection (I-words), cognitive complexity, and relative low rates of negative emotion. Compared to the first debate, both Romney and Obama are both becoming more authentic. 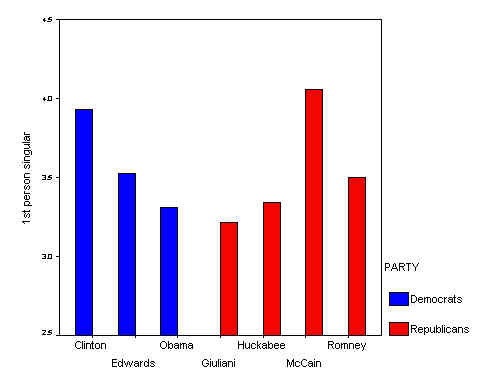 However, Romney maintains a small lead (4.6 vs 4.2; compared to the first debate where Romney beat Obama by 4.4 vs 3.5). In the first debate, both men were quite similar, with Obama leading slightly. In the second debate, Romney made strides in sounding more optimistic. Ultimately, however, both were consistently emotionally distant. Contrary to common wisdom, the rate of anger words was virtually identical to the first debate. Most pundits claim that this was a more hostile debate but in anger word usage, it wasn’t. Using Language Style Matching, or LSM, we can calculate the degree to which each presidential candidate uses language congruent with the moderator Candy Crowley or the TV-studio audience question-askers. We assume that the more similar the language style, the more the candidate is answering the questions and reflecting the thinking of the questioner. In the first debate, both men were equally evasive with Lehrer. In the second debate, both men answered all the questions more directly. However, Romney was reliably more on target with the questions than was Obama (LSM coefficients for Romney were .94 vs .92 for Obama with Crowley; .90 for Romney vs .86 for Obama with audience questions). Interestingly, the two candidates matched in their language styles slightly more in the second debate (LSM coefficient of .95) relative to the first debate (.92), indicating greater engagement with one another. So, although the candidates were not firing more angry words, the more subtle language style metric indicates that the candidates are increasingly vigilant about what the other is saying; things are indeed heating up. Standing back, what does all of this mean about the basic personality or character of both men? It’s important to emphasize that both men use language the same ways they did four years ago. The debates are simply revealing that they are the same people we have always known. Obama. Barack Obama is psychologically cool. He does not use personal or emotional language at high rates. Although he is a narrative thinker, he is not close to people. If you listen to the way he answers questions, he tends to provide a brief history and context. He is highly confident in his abilities. Above all, he is consistent. He has probably changed less in the last four years than any other president since Franklin Roosevelt changed during their first term. Romney. Mitt Romney is surprisingly similar to Obama. He is psychologically distant although he uses I-words at rates slightly higher than Obama. He is not particularly emotional nor is he socially connected to others. The one difference from Obama is that Romney’s thinking is very male-like. He uses a very high rate of articles and nouns — a sign that he tends to categorize and label problems in a traditional way. The way he approaches problem is not unlike that of George W. Bush, Jimmy Carter, and Richard Nixon. Tune into Sosolimited’s web app, reconstitution2012.com, during the third debate (10/22/12) for a live language analysis. Following the third debate, we will explore the psychological dimensions of both candidates in greater detail.